Join Fleming’s Prime Steakhouse & Wine Bar (25 E. Ohio St., 312-329-9463) at 6:30 p.m. Saturday, Jan. 29 for a one-night celebration of top wines from critically acclaimed Revana Family Vineyard in Napa Valley, including their superb 2007 Cabernet Sauvignon, ranked #4 on Wine Spectator’s Top 100 List for 2010. The cost to attend is $125 per person, including the wines. This event also features selections from Revana’s sister winery Alexana in Willamette Valley, Ore., all paired with a special five-course menu created by Fleming’s Chef Partner Jerl Griffin. As a special treat, guests will be joined by Dr. Madaiah Revana, the winery owner, who will personally introduce these extraordinary wines. The evening begins with Bacon Wrapped New Bedford Scallops with Citrus Chutney, paired with ALEXANA, Riesling Willamette Valley Oregon, 2008; followed by a Caesar Salad with Alaskan King Crab and ALEXANA, Pinot Gris Willamette Valley Oregon, 2007. The next course is a Creamy Polenta with Duck topped with Cherry Reduction and paired with ALEXANA, Pinot Noir Willamette Valley Oregon Revana Vineyard, 2007. (91 points, Wine Spectator; 92 points, Wine Advocate). The entrée is a Peppercorn Filet served with Gorgonzola Mashed Potatoes and Sautéed Spinach, paired with REVANA, Cabernet Sauvignon Napa Valley, 2005 (92 points, Wine Advocate); and REVANA, Cabernet Sauvignon Napa Valley, 2007 (97 points, Wine Spectator). The evening concludes with a dessert of Chocolate Mousse Cake with Almond Brittle and Crème Anglaise, served with coffee and tea. Contact the Chicago location of Fleming’s Prime Steakhouse & Wine Bar to attend this event at (312) 329-9463. 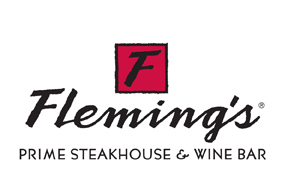 The nationally acclaimed Fleming’s Prime Steakhouse & Wine Bar offers the best steakhouse dining – prime meats and chops, fresh fish and poultry, generous salads and side orders – with a unique wine list known as the “Fleming’s 100” that features 100 wines served by the glass. Fleming’s is the recipient of numerous prestigious awards, including Wine Enthusiast’s annual Awards of Distinction and Wine Spectator’s annual Awards of Excellence. Visit www.FlemingsSteakhouse.com for more information.